An extraordinary video installation touring the U.S. and Europe is knocking the socks off the art world and critics are calling it a modern masterpiece! “The Clock,” by artist Christian Marclay, is a 24-hour-long film consisting of over 3,000 old and brand new movie clips spliced together. In each film clip a clock appears or someone refers to time…the time in the film and the real time according to our watches! The edited film clips don’t tell a conventional story. Yet, there is a story. It is about being aware of time…all the time. “The Clock” is shown in an art gallery or art space (coming this summer 2012, to the Lincoln Center in New York City). Comfy couches are arranged in front of a large screen. The film runs 24 hours continuously. You can stay as long as you like. What is so fascinating is how the film touches on our anxiety over time. We know time is passing and to some extent feel its tyranny. 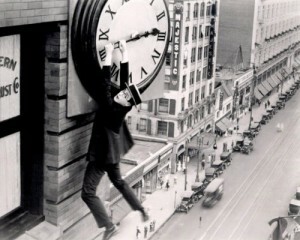 The fictional characters in the film make us very aware of this passing of time. For instance, at 12:27 A.M., there is a clip of a resplendently dewy Catherine Deneuve, then twenty-one years old, from “Repulsion.” Four hours later, she’s three decades older, in “My Favorite Season,” an embittered wife intentionally knocking a clock off a fireplace. At 1:51 A.M. Jack Nicholson is a frantic juvenile delinquent in “The Cry Baby Killer,” at 4:59 P.M. he is the paunchy and bald hero of “About Schmidt,” gazing at his office clock as he dully awaits retirement. Keep in mind that when we see Nicholson looking at his office clock at 4:59 P.M. in the film clip, it truly is 4:59 P.M. in our real time…by our watches. Time in “The Clock” corresponds with our local time. It has only been 3 hours and 8 minutes since he was the juvenile delinquent in the film. But we know it has really been 55 years. We become wide awake to Deneuve and Nicholson’s mortality…and hence, our own. That is what is so captivating about “The Clock.” The segments of film are married up to the great themes in life…love, death and the meaning of our lives. Click this link if unable to view the video. This IS genius! What an imaginative idea in the first place. Then to put the whole thing together in real time – amazing! Thanks so much. Only wish I could see it. . . I will try to find the website for “The Clock” & the schedule. If find it I will post it. Who knows.. It may come to San Diego! Not sure I have enough “T-I-M-E” to really comment on this..
Kirby. After some thought, I must say that I have little to offer. I can still recall “Clock Orange”. Memorable only because it was largely forgettable. But a great change of pace. Always beast to keep one just a bit unpredictable.